From an Outline to a 3D Object! Magicalsketch 3D is a software that can easily create colored 3D data ready to be 3D Printed! With a single stroke, create an outline that will automatically be transformed in a 3-Dimensional shape. 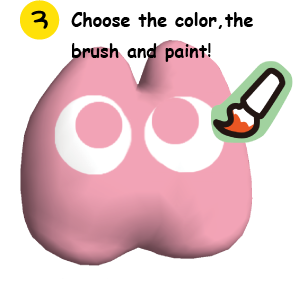 For the painting process, you can select different brushes and even use a photo or a drawing with the Stamp tool! It is also possible to save the created object for 3D printing in two file formats (OBJ / STL). If you own a 3D printer at home, you do not have to ask a Print shop to get your object! In MagicalSketch 3D, you can see your creation in OBJ and STL in other 3DCG creation software ! When you release the pen tool after creating the outline, the 3D is automatically created from the contour. You can cut and modify your object with the Scissors tool. Rotate and observe your object, you can add more details by simply creating more shapes or extruding new shapes from the model! Choose the Color, .... and the Brush! Now you only have to select the color and the brush you want to use! You can choose hard brushes, soft/blurred brushes, the double brush that will paint in a Mirror way (same color/pattern front and back) and also use photos or illustrations with the powerful stamp tool! You can also bring your object in the real world with the amazing 3D Printing technology! MagicalSketch 3D supports the OBJ format and STL format that are widely used in the 3D printing industry. The OBJ format will allow you to 3D print the model in color, or save in STL to print without any color (depending on the 3D printer's type). If you do not own a 3D printer, check if some 3D Printing shops are available near you! Export and modify your object with other 3DCG software! Thanks to the OBJ/STL export options, you can try to animate the character you have just created with MagicalSketch 3D, or add different details with, for instance, Shade 3D!